Clean and wash the chicken. Set in a pressure cooker and add the 12 cups of water, salt, garlic and cilantro. Close the cooker and when the valve begins to vibrate, lower the temperature and cook for 15 minutes (check the cooker instructions for cooking chicken). If you don't have a pressure cooker, you can use a normal pot to cook the chicken. It will take a little while longer to prepare, some 25-30 minutes, just be sure to check the chicken until it’s soft and easy to shred. While the chicken is cooking, wash, peel and chop the carrots and pumpkin. If you're using a pressure cooker, after cooking chicken for 15 minutes, turn off and let meat cool according to manufacturer instructions. Open the cooker carefully. If you're using a normal stock pot, simply check that the chicken is cooked. Take 1 cup of the chicken consommé and pour it into a blender. Add the tomatoes and chipotle pepper and blend until all ingredients are fully integrated. Put the chopped vegetables and consommé mix in another pot. Return to burner and let boil for approximately 15 minutes until the vegetables soften. Meanwhile, shred the chicken. 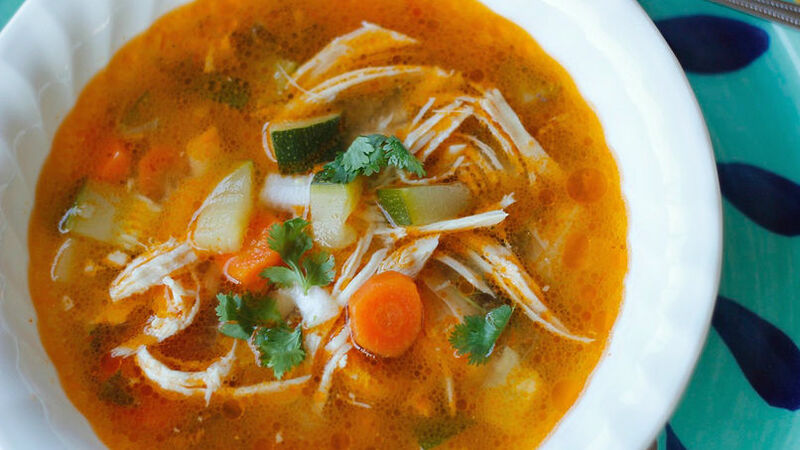 When the vegetables have cooked, add the shredded chicken to the stock. Serve immediately with warm tortillas, some lemon juice and if so desired, some fresh, chopped onion. Whole chicken works best to give the stock good flavor; however, if you don't have a whole chicken, you can cook different pieces of chicken, making sure to remove all bones. Try adding other vegetables that you like, such as peas, chayotes or broccoli. As we bid farewell to summer and autumn makes its entrance, I start pulling out my soup and broth recipes. There's nothing better than a bowl of hot broth to comfort the heart. My oldest son is a fan of broths, whether it's hot or cold out, he always smiles when I put a steamy bowl in front of him. However, chicken consommé is one of his favorites. Since he loves chipotle peppers, I decided to make a slight change to my traditional consommé by adding a tomato sauce with adobo chipotle peppers, which gave it a smoky, spicy sabor. One of the benefits of this broth is that you can add as many veggies as you'd like. Furthermore, if your kids aren't huge vegetable fans, this is the best way to benefit from all the nutrients these veggies have to offer. If my kids don't want to eat the vegetables or meat in the consommé, I don't worry too much because I know the vitamins and minerals have been transferred to the broth. The other benefit is that consommé is very inexpensive, and it serves many. This recipe feeds my family of four and we're left with plenty of leftovers for another meal. ¡Buen provecho!